You will be able to select 12 riders that will represent your startlist or team in a Najaarscompetitie 2018 stage. You can select riders from all participating teams. You can do this through this website and, of course, before the deadline for each stage. These 12 riders will score you points (Or not, if you got the wrong riders), that score will be entered in the General Classification. 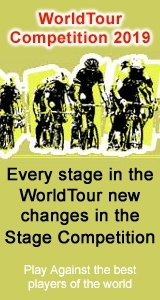 Your scores will be added up and will result in the Stage competition’s general classification. As soon as you have more than 14 scores, your lesser results are deleted in the general classification. Only your 14 best results will be used to make up the classification. So, the more stages you enter, the more good scores will remain. Below your cycling team you'll see all the teams that were entered into the Najaarscompetitie 2018. Beside each team the rider selection dropbox will show all the riders not yet selected into your team. Note: Untill the startlist is definitive the dropbox contains riders in black, those are the one that are prognosed to ride the Najaarscompetitie 2018, and riders in grey, the riders that probably will not ride the Najaarscompetitie 2018. As soon as the startlist is definitive you can only choose riders that are on the startlist. Please check your team shortly before the deadline if all riders you have selected will participate and replace the ones that don't. Your scores will be added up and will result in the Stage competition’s general classification. Whoever scores the most points during the Race, will win the Najaarscompetitie 2018 StageCompetition.